It’s hard to believe we’re almost through November already and looking forward to the Thanksgiving holiday! I didn’t realize until this year that November is also American Diabetes Month. In 2012, 9.3% of the American population (or 29.1 million Americans) had diabetes, so chances are that you or someone you know has been diagnosed with it. I recently received a review copy of the Two-Step Diabetes Cookbook by Nancy S. Hughes, so I thought I’d share a little about the book and try out a recipe. I decided to try the Breakfast Berry Scooper Cake, which is served with Greek yogurt. This breakfast cake is very, very moist, lightly-sweet and packed with fruit. If you serve this hot, you can scoop it out of the pan. If you serve it warm or cool, you can cut into squares, which is what I did. The yogurt is a nice creamy pairing with the cake, giving you a slightly sweet, slightly tart taste combination–a great option for your morning meal! Preheat oven to 350˚F. Meanwhile, combine the flour, all but 2 teaspoons of the sugar, baking powder, baking soda, cinnamon, salt, buttermilk, egg, oil, and extract in a medium bowl. Whisk together until smooth and pour into an 8-inch square baking pan coated with cooking spray; top with the frozen berries. Cook’s Tip: If serving hot, use a spoon to remove. It will be a “loose” pudding cake texture. If serving warm, carefully cut into squares and use a flat spatula to remove; it will be a very moist pudding cake texture. If serving room temperature, cut into squares. Use a flat spatula to remove. It will be a firmer, but still very moist, pudding cake texture. My cake had browned quite a bit on top, so next time I’ll check to see if it’s done at 55 minutes instead of 60. You may want to do that too, especially if your oven tends to run hot. Even if you don’t have diabetes, the recipes in this cookbook give you lots of great ideas on ways to eat healthier. What are some of your favorite healthy breakfast dishes? Linked to Fiesta Friday, FoodieFriDIY, Sunday Features, Nifty Thrifty Sunday, Inspire Me Monday, Show and Share, Tasty Tuesday, Wow Us Wednesdays, Wake Up Wednesday, Wow Me Wednesday, Whimsy Wednesday, Wonderful Wednesday, Share Your Style, Create It Thursday, Full Plate Thursday, Thursday Favorite Things, Showcase Your Talent Thursday, Fabulous Foodie Friday, Feathered Nest Friday. This entry was posted in Breakfast/Brunch, Food and Recipes, Healthy Eating, Reviews and tagged breakfast, Breakfast Cake, frozen berries on November 20, 2015 by nancyc. I’ve been putting off making granola because it’s been so hot outside! I try to avoid using my oven if I don’t need to when the weather is really hot, but I was really wanting to make some granola. So I got up very early one Saturday morning–which lately has been the coolest, least humid part of the day–and made this Vanilla-Almond Granola. It seemed like a nice, basic, summery flavor to try. I really like the vanilla-almond combination. You’ll notice that it does have quite a bit of vanilla in it–2 whole Tablespoons! It’s a slightly sweet granola, so if you like yours more sweet, add in the brown sugar, which I have listed as an optional ingredient. It’s sweet enough for me without the brown sugar, though, and I love eating this sprinkled on top of some vanilla Greek yogurt–a good, easy breakfast for the summer months! Preheat oven to 300˚F. Line a 10 x 15″ or 13 x 18″ baking sheet with parchment paper; set aside. In a large bowl, toss the oats, almonds, wheat germ or ground flax seed, sunflower kernels, brown sugar (if using), salt, cinnamon, and nutmeg; set aside. In a small microwaveable bowl, heat honey for 20 to 30 seconds to make the consistency thinner. Then, in a medium size bowl, blend honey and melted coconut oil. Stir in the almond and vanilla extracts, blending everything well. Pour honey mixture over oat mixture and toss until the oat mixture is well coated. Spread granola mixture on prepared baking sheet and bake at 300˚F for 45 minutes, until mixture is golden, stirring every 15 minutes. Remove from oven and let granola cool completely (the mixture will get crunchier as it cools). Store in an airtight container at room temperature for up to three weeks. I’ve heard that you can also freeze homemade granola for two to three months, although I haven’t tried that myself yet. This granola would also be good sprinkled over ice cream for dessert. 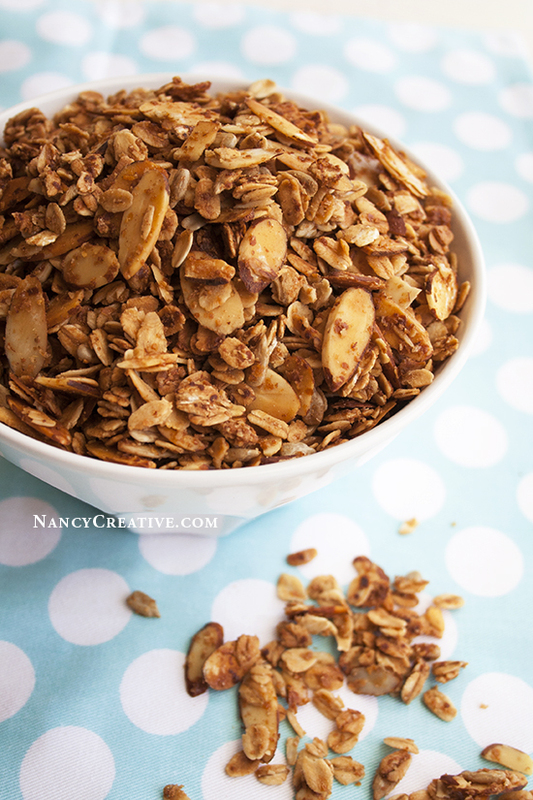 Have you made any special homemade granola flavors this summer? Linked to Fiesta Friday, Inspire Me Monday, Wow Us Wednesdays, Full Plate Thursday, Inspiration Thursday, Let’s Get Real Friday, Show and Share. This entry was posted in Breakfast/Brunch, Food and Recipes, Healthy Eating and tagged almonds, breakfast, homemade granola, honey on July 24, 2015 by nancyc.